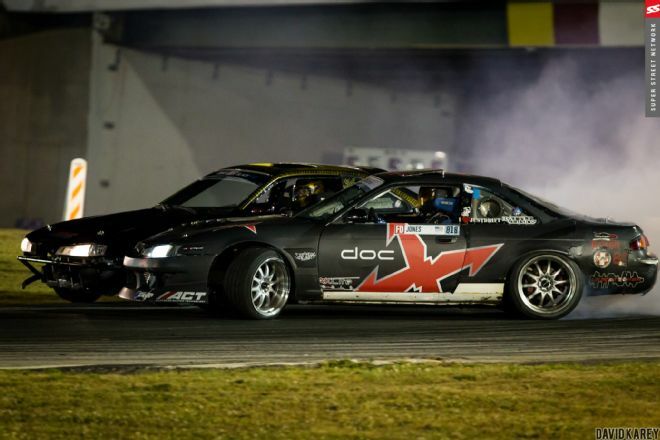 We have high hopes for Formula D’s Pro2 championship, particularly considering the epic-ness of its 2015 run. In between the driving artistry of Andy Gray in his Mark II and the brute force of eventual season champ Alex Heilbrunn in his blown V8 E46, plus the rest of the cast of young and hungry hot shoes, last year’s crop of talent kept us on the edge of our seats for all four rounds. So when it was announced the 2016 Pro2 championship would begin at Road Atlanta, we knew drama would ensue – but we would’ve never guessed in a million years things would go down the way they did. We can say pretty unequivocally there were a lot of jitters on display, primarily from rookie pilots like Midwest Drift Union champ Dirk Stratton in his Drift ‘Vette and Sheng Ng Nian in his Chaser out of Singapore (there were others, too). Neither made it out of the round of 16 in tandem eliminations; both probably wished they had another chance to put together a pair of not-so-erratic runs (in the case of Nian, he got a One More Time (OMT) tiebreaker against our boy RAD Dan Burkett in the RAD Industries Mk4 Supra but still couldn’t keep it together).